Im a professional Guitarist, musician and teacher. I am an expert in contemporary guitar playing and specialize in modern rock, metal, jazz, blues and fusion techniques and harmony.I studied at the prestigious Guitar Institute which is part of London's Institute of Contemporary Music Performance in 2009. Outside of my teaching i am a session musician in the studio and playing in Pitt performances for shows. i also play in function bands and the Jazz guitar duo Elektrik jazz at weddings, parties, corporate functions and in bars pubs and restaurants. I began teaching the guitar when i was just seventeen years old when my then guitar tutor wanted to retire. he needed someone to take over his students and was keen to ask me to do so. This was at a local music store, who after seeing my success with these first few students on a Saturday morning gave me a job teaching all day Saturday and several evenings in the week. I continued teaching here throughout my studies and eventually when i graduated i took a position as a tutor with **Removed By Admin** music service (now Inspiring music). After 3 successful years with **Removed By Admin**music i decided to set up my own guitar tuition company called**Removed By Admin**r which now operates in schools across Bedfordshire, and also from a residency at **Removed By Admin** in Northampton, where my evening teaching takes place. My approach to learning the guitar, is mainly that it should always be fun and rewarding, and that the student should always get what they want and require.Whether you are 50 years old and have just spent £4,000 on that dream guitar you've always wanted or you are seven years old and have your first little acoustic, it is my firm belief that you should be getting the maximum amount of pleasure from your chosen instrument. Whilst at the same time getting exactly what it is that you, as an individual, require.Whether that is the tools to be able to play the latest sweep picking lick that everyone wants to know, or you just want to strum the chords to Sweet Home Alabama, whatever you want, you should have it. With me, all lesson types are catered for. 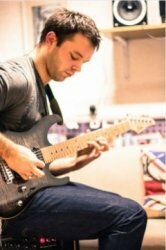 From complete beginners at the earliest age, to GCSE and A Level Music, to professional standard players looking to hone a particular technique or if you are just a humble bedroom guitarist, looking for pleasure from an amazing hobby, I can deliver any type of lesson you may require.